Would that controversial billboard even be visible from Fairmount Park? When I heard that my former Philadelphia city councilman wanted to amend the city’s zoning code so a billboard could pop up in Fairmount Park, the worst-case scenarios instantly came to mind. They’re so blinded by a need for money that they’ll visually adulterate a green space in the name of revenues. They say it’s only one billboard, but soon, you won’t be able to see a single tree near the Belmont Plateau; it’ll be a NASCAR driver’s uniform in the form of a park. Those were the initial thoughts. Well, overreactions would technically be a better description. When news of Councilman Curtis Jones’ bill came up at last week’s session, opposition quickly galvanized online. “Sign our petition to voice your opposition to this proposal to unlawfully change the rules to allow for a double-sided digital billboard on open space in Fairmount Park!” read a Scenic Philadelphia petition that had 1,033 signatures as of Wednesday afternoon. Sure, Jones’ bill would allow for a single, double-sided digital sign bound by the Schyulkill Expressway, Greenland Drive, Martin Luther King Drive and Montgomery Drive. Opponents say such a move would violate the Highway Beautification Act, introduced by President Lyndon Johnson in 1965 “to promote the safety and recreational value of public travel, and to preserve natural beauty” of highways. 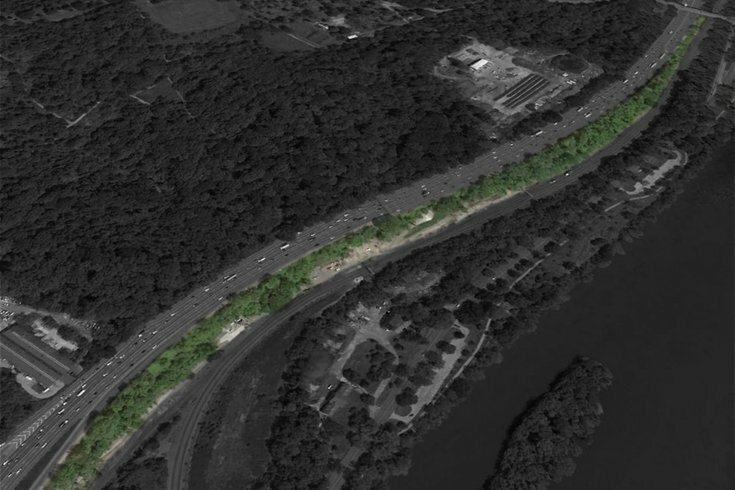 Setting aside that the Schuylkill Expressway is anything but naturally beautiful, legislation that commodifies green space takes away from its inherent vibe of relaxation and peacefulness. So, yes, putting digital billboards smack dab in the middle of Fairmount (and any other) Park should be a non-starter. Jones’ bill has gotten Philadelphia City Planning Commission consideration. Paul Chrystie, director of communications for the city's Department of Planning and Development, said the matter came up before the Planning Commission this week. The commission "does not recommend approval." Council’s Rules Committee scheduled to hear it next Wednesday (May 23) – the path that led to this, and the location itself, warrants a closer look. Jones’ chief-of-staff Josh Cohen explained how the bill came to be. It’s about relocating an existing billboard from the foot of the South Street Bridge, he said. That suitable location – a narrow strip of land between the Schuylkill Expressway and CSX railyard – never should have been zoned as a “Parks and Open Space” area as it’s more industrial, Cohen maintained. Ruing “a lot of misinformation” being bandied about, he also made one important point that, if true, should soothe many concerns. “You cannot see the billboard from any point in the park,” he said. All of this isn’t to say more billboards are necessarily a good thing. They can be eyesores and distractions. But this one doesn’t seem to be worth a heated battle, provided Cohen’s right about sight lines from the park. That said, there’s value to the mounting opposition. If this case establishes a red line that staves off any billboards viewable from parks now, or in the future, it’s a conversation worth having.